Living Online: Upscoop, Spy Your Friends? 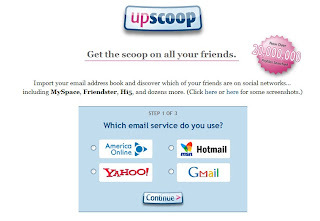 Upscoop is a free service that allows you to upload your email address book and find all your friends on the major social networking sites and online communities. But if you want use it you must offer your main email contact list (who want to do that? ), and Upscoop will search social networking sites to see which of your friends are on what site. I do not think that service will attract more users, you need use your email ID and password with this site, and you need offer your email address lists, what for? For search where your friends are? Sounds stupid for me. Spy your friends? Why you want know where they are? If they like tell you where they are you can ask, if not, why you need to know?